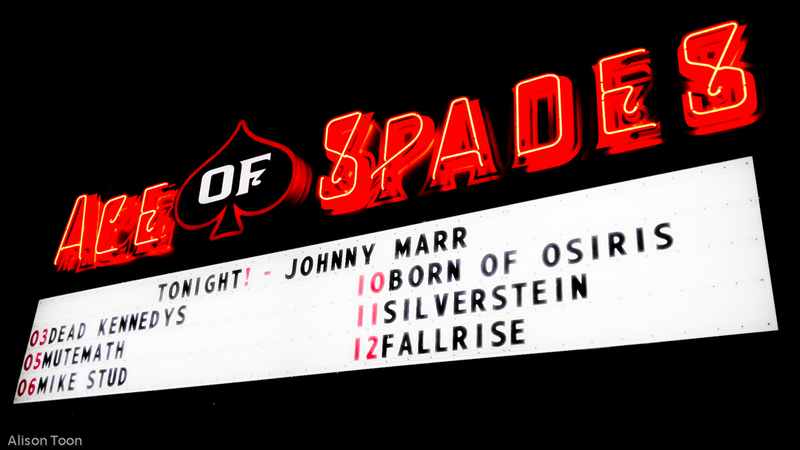 Last night, I saw Johnny Marr, live and in person, here in Sacramento, California, USA, and on stage at the Ace of Spades. It was my second attempt to see him in concert; the first attempt was in 1983 (no that is not a typo, it was 16th November 1983), in England, where I grew up. It was a day when the still-relatively-new and very-different band that Mr. Marr was playing in at that time was beginning to make itself known on the radio and through NME reviews, and they were performing at Leicester Poly... they hadn't released their first album yet, that came in early 1984 and was titled The Smiths and I knew, just knew, that I had to see them but... it happened to be the very same night that the Eurythmics were playing Leicester De Montfort Hall. My ex and I had only enough money for one concert that week (month, year, decade), could only be in one place at a time... I lost the argument. The Eurythmics won, riding high on the release of Sweet Dreams earlier that year. I sulked all that evening. I wasn't where I wanted to be. The show was so very, very perfect, it was like watching Annie and Dave through a large pane of totally-clear glass... a bit like a big-screen TV, though we didn't have those back then, the TVs were still cubic and clunky and not-at-all high-res... and yes, I am glad that I had the chance to see the Eurythmics, absolutely, but I still feel a tiny bit peeved that I didn't see the Smiths in those early days... Just don't let's talk about it any more, OK??? Roll forwards far-too-many-years-to-mention, and we're in the USA, at the Ace of Spades, which is maybe two-thirds full: there's a different support band to the one advertised, the date of the concert was shifted from Sunday to Wednesday because of visa issues (again--Cradle of Filth recently lost several tour dates to the same immigration black hole) which maybe accounts for the venue not bursting at the seams while other dates in California sold out; some jerk had just spilled beer all over me and my new phone, it was a workweek-evening gig and... and then Johnny Marr and the band were on stage, the show really started, and I was very, very glad to be there. The show started with Back in the Box from Playland, then straight to The Smiths' Stop Me If You Think You've Heard This One Before, then Easy Money from Playland, and so it went all evening, a mix of purely Johnny Marr songs with oldies from the Smiths days, which of course he co-wrote. If you went to the show expecting to hear the Smiths, you didn't. These songs take on a full new, and very welcome, sound. A new song called Spiral Cities. Bigmouth Strikes Again. Generate, Generate... a proper, good, long show, I counted about eighteen songs. Plus a possible explanation for the visa delay... don't mention Donald Trumps' hair!!! 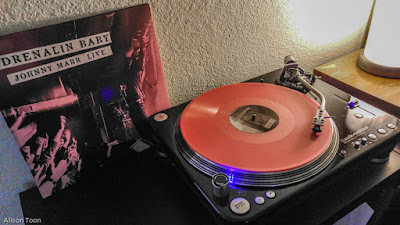 The beauty of Mr Marrs music is in its controlled simplicity; it's not simple-easy, but rather a constrained, framed, perfected and dreamlike-easy sound inside an broken-through-all-barriers alternate-rock persona. Hell, the guy made alternate in the first place. And don't you know, last night he still looked, played and moved just like he would have done had I won the big argument back in 1983. Painting in the attic, or good lifestyle choices? I think the latter.